UU’s Mykee Holtz (pictured) doubled twice and had 3 RBI in Wednesday’s first game. 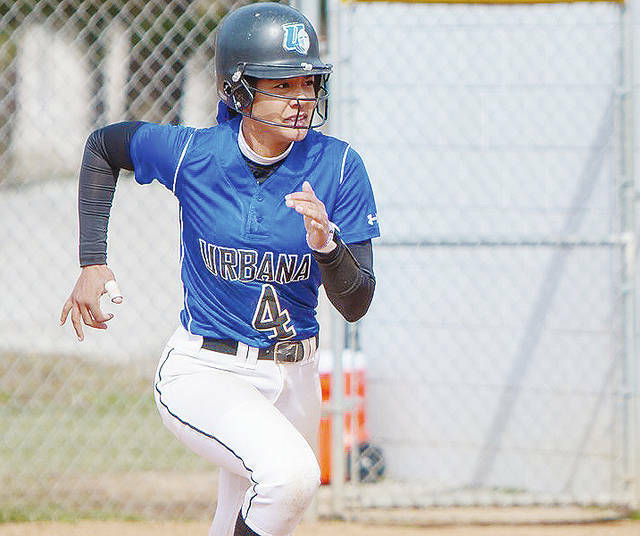 Urbana University softball busted out of its recent slump with 15 hits in Wednesday’s 9-1 win over Notre Dame College. All nine UU batters registered a hit in the first game of the league doubleheader at Blue Knight Softball Field. The visiting Falcons rebounded with an 8-0 triumph in Game 2. Following Wednesday’s split, UU moved to 7-35 overall and 5-19 in league games. The Blue Knights snapped a nine-game losing streak and claimed the season series against NDC, 3-1. The Falcons now sit at 13-26 (9-15 MEC) overall. UU went up 6-1 after a five-run third and tacked on three more runs to end the game in the sixth via run rule. Freshman pitcher Kayleigh Pate held the Falcons to just three hits and provided the walk-off single. The right-hander now leads UU with four wins inside the circle. All nine batters recorded a base knock and five players had multi-hit efforts. Senior Riley Curtis went 3 for 4 with three runs scored while sophomore Mykee Holtz doubled twice to finish with three RBI. Sophomore Kylah Swanson (1 for 4) and senior Briana Bamber (1 for 3) also delivered RBIs. NDC’s starting pitcher Taylor Olson was tagged with the loss (6-14). Roles reversed in the second game as the visitors plated seven runs over the final two innings. UU starter Carly Allen pitched well until running into trouble in the sixth, when the Falcons scored four runs to move ahead 5-0. The Blue Knights went cold at the plate and totaled only four hits combined from Jenna VanHoose, Britney Bonno, Curtis and Holtz. Curtis ran her current team-leading hitting streak to five games. NDC starting pitcher McKenzie Zigmont tossed a complete game with four strikeouts and two walks. The right-hander stranded three runners at third base to eliminate any of UU’s scoring chances. UU remains at home this weekend for a pair of doubleheaders against Concord (Saturday) and UVa-Wise (Sunday). https://www.urbanacitizen.com/wp-content/uploads/sites/36/2018/04/web1_uusoftball.jpgUU’s Mykee Holtz (pictured) doubled twice and had 3 RBI in Wednesday’s first game.